Day 2 started with another Battle Line and this time I was to face Rowan and his heavily armored Empire. Little I knew about the fact that Rowan is actually famous JPM among Australian warhammer players and is very high ranking one too! His most recent success prior Wintercon was to win a tournament with a MSU Tomb King army. I was very happy when I found that I am going to play against such a successful and skilled player as I was sure I was about to learn a valuable lesson. I would also like to add that Rowan's army looked absolutely fantastic! I haven't had many opportunities to play against Empire in 8th edition so far. Two games I had were quite traumatic experiences too. Now they have new army book and people are still learning how to play with and against it. It is also hard to anticipate what exactly Empire army is going to contain as different builds seem to viable at the moment. Rowan decided to bring the following list which is his army-in-progress as he told me. He plans to paint more infantry and his artillery is going to be stronger for the upcoming ETC he is going to take part in. Hm, a lot of 1+ armor saves all around. Significant amount of artillery and in general shooting that can be dangerous although it does not look like it is (especially that it can be much nastier). Tough deathstar unit. How to deal with it? 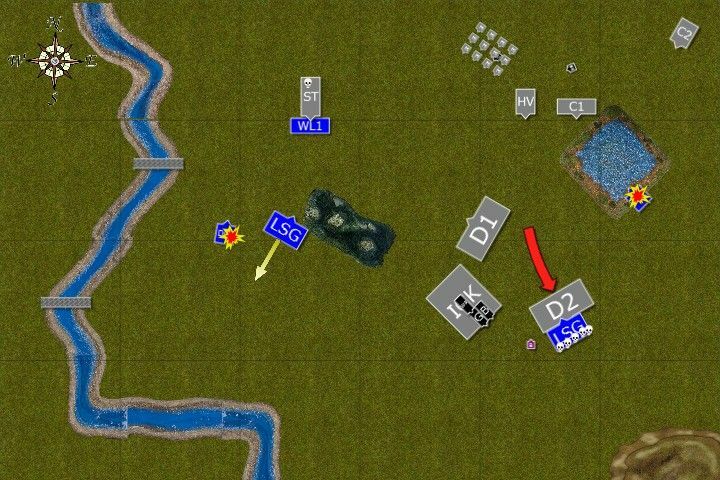 Well, I thought it would be good idea to divert Inner Circle Knights while I run towards the artillery and softer regiments. I also though my White Lions and Swordmasters are a match for demigryphs. Steamtank was a problem but I decided to hold it with my Archmage if possible. All in all I was ready for exchange of blows and trusted in my more numerous regiments and greater maneuverability to put up the fight and maybe even earn more points than my skilled opponent. Wizard Lord joined Huntsmen, engineers were close to war machines while all other characters joined Inner Circle Knights. Elven Archmage was with Western Swordmasters while BSB joined Eastern Sea Guard. Empire won the roll off and started moved first. The grandmaster ordered his unit to move forward at full speed while one of his flank was guarded by demigryphs. 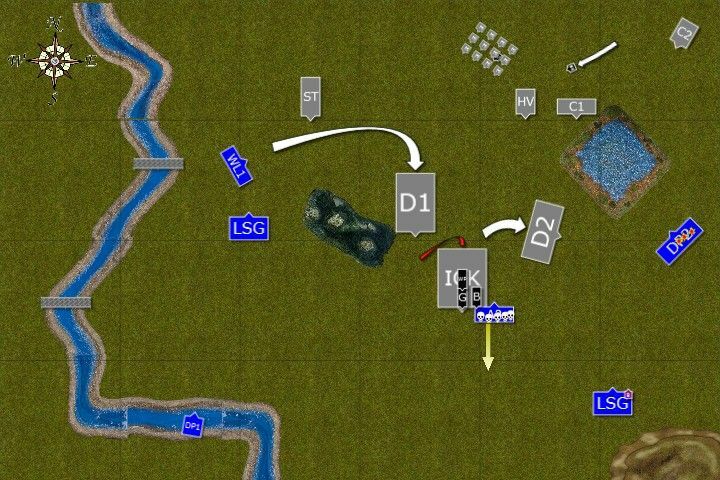 Both flanks of the army, however, were to hold back to draw the enemy in. Engineer directing fire of the hellblaster volleygun aimed at closing light cavalry and insane device roared. One of the valiant elven cavalry units ceased to exist. Then his companion from the artillery school send his pigeons with deadly message towards the second regiment of light horse and ordered nearby crossbowmen to add to the destruction. After that only single Elven warrior remained alive but he didn't falter. On the Western flank Demigryphs moved a little forward and Steamtank was supposed to follow but a malfunction occurred in the steam engine and some internal explosions could be heard while the engineer driving it was busy with hasty repairs. Lone survivor of the artillery barrage spurred his horse to avenge his companions but whatever luck let him live through the bullets and bolts deserted him when his horse broke a leg in a treacherous marches during his desperate charge. Dragon Princes and White Lions followed but had to keep some distance due to proximity of Demigryphs. BSB led his unit and nearby archers to a slightly better position which was still quite difficult due to intervening enemy units. Only a single crew member was killed by usually very accurate elven arrows. 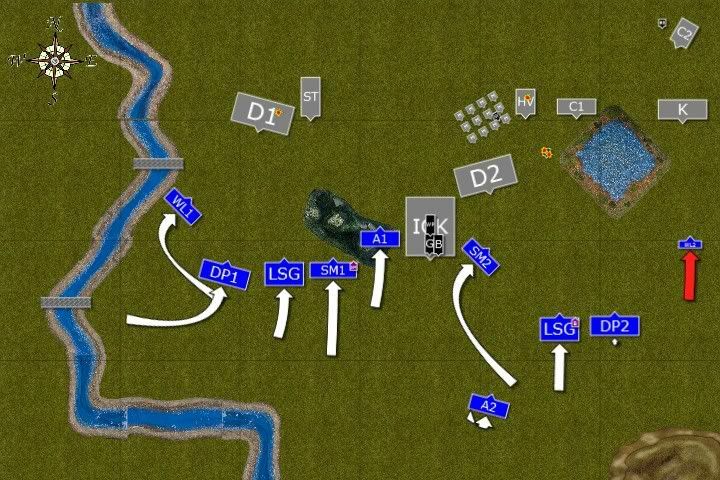 On the West all regiments moved forward too, ready to engage seemingly weaker flank of the enemy army. Archmage attempted to cast a magic missile at Demigryphs to try to bring their number down but full plate armor was thick and only a single wound was inflicted. 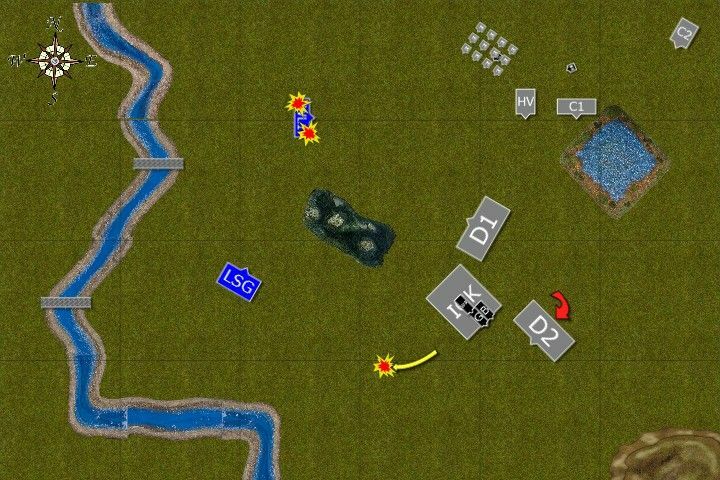 Empire artillery crews acquired new targets and opened fire. As a result one great eagle was no more thanks to well aimed cannon ball and lion pelts proved little protection against hellblaster and crossbows and only 3 Chracians survived the onslaught. 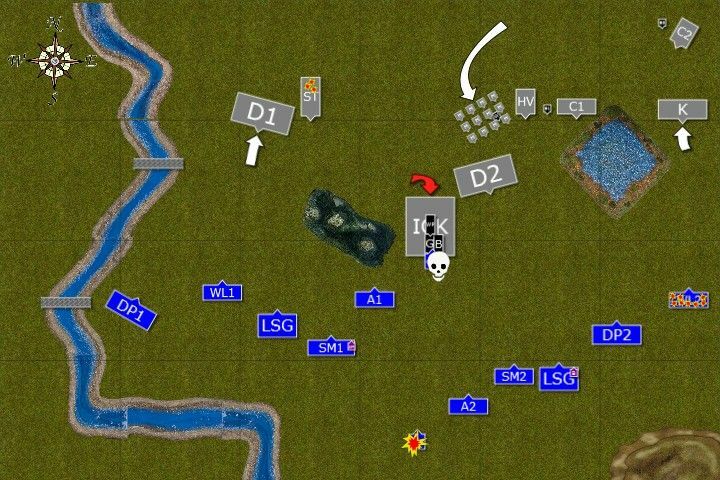 Second eagle was quickly killed by grandmaster who ordered his regiment to hold the position. Only engineer of a steamtank could not keep his machine running properly and another series of internal explosions meant he decided not to move it until he is sure all is properly fixed. 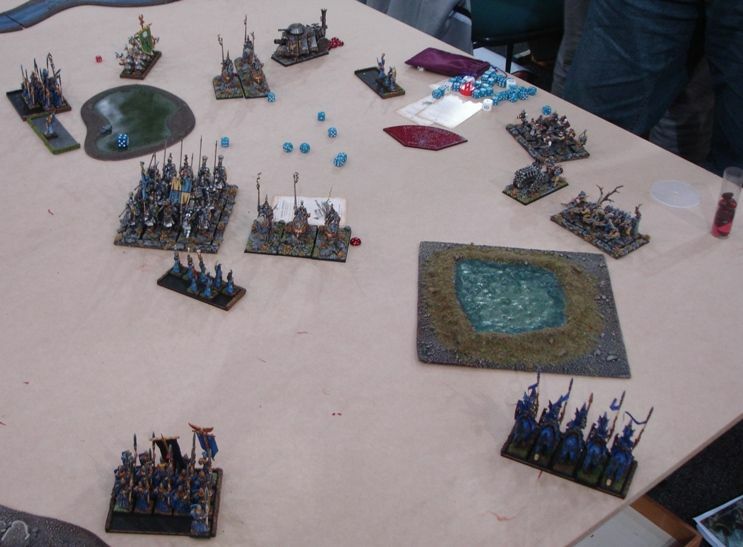 With enemy heavy cavalry closing and murderous artillery still intact Elves gambled on very risky plan. 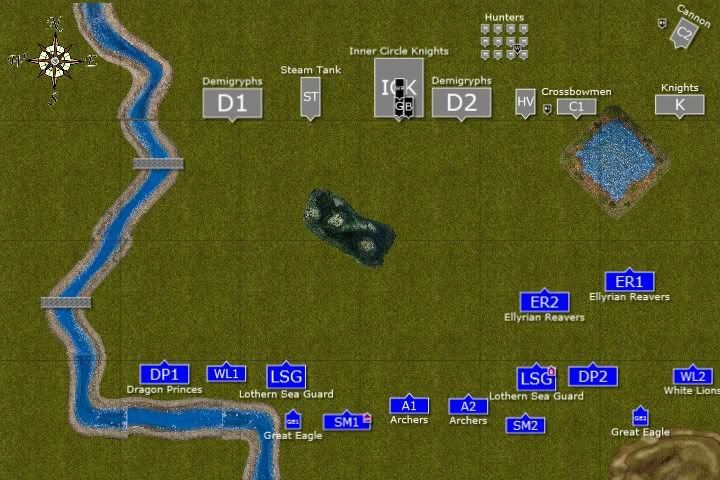 White Lions attempted a long charge at small regiments of knights but fell short. 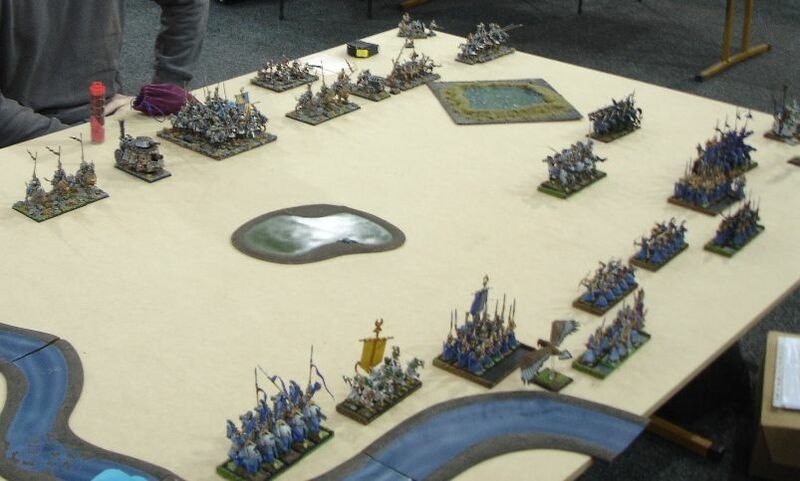 Swordmasters run past the knights and got ready for the charge of Demigryphs. Nearby archers and sea guard aimed at the engineer. One of the hellblaster crew members tried to save him and died instead but then the engineer ordered the last remaining artilleryman to keep his war machine firing. That was his last order as second after white shafts pierced his heart. On the West elven regiments closed in again in order to catch demigryphs and destroy steamtank. Elven Archmage with some aid of sea guard once again tried to hurt enemy monstrous cavalry and yet again only single wound was inflicted. Empire Knights charged White Lions who fail to kill even single human and are all dead shortly after. Then, in the battle of minds celestial wizard summons enough power to break through elven archmage defenses and chain of lightnings strikes many elven regiments inflicting horrible damage (Edit: Rowan got the required casting value on 4 dice, I attempted to dispel with 5 and promptly rolled triple 1 among them, failing to dispel. Ouch!). Dragon Princes fail to keep their mounts steady and survivors are carried away from the enemy. Using a moment of lack of concentration of the elven archmage, celestial wizard protects demighryphs charging into combat against Swordmasters. Warriors of Hoeth swung their massive blades with expert precision but somehow the full plate armor proved too much even for them. They stand no chance against ferocious counter attack of demighryphs and all died where they stood. 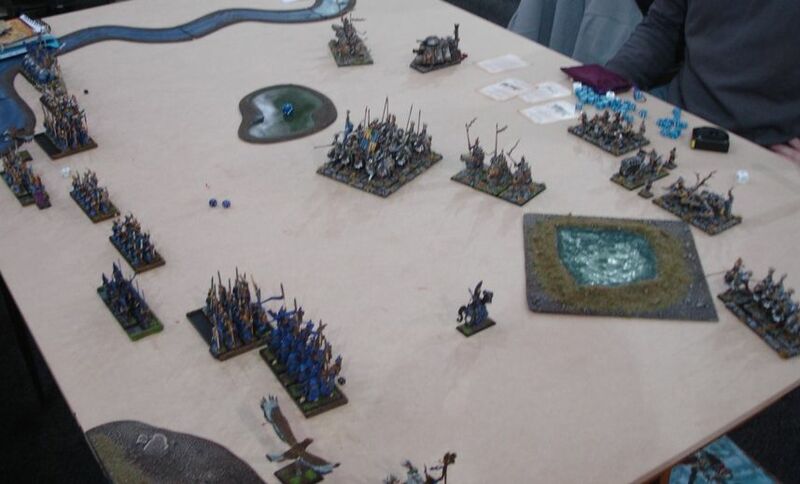 Grandmaster spotted unguarded flank of the elven Sea Guard and ordered charge against them but elves withdrew and this time knightly charge didn't strike home. Dragon Princes on the East charged their counterparts and broke the enemy who fled the battle. 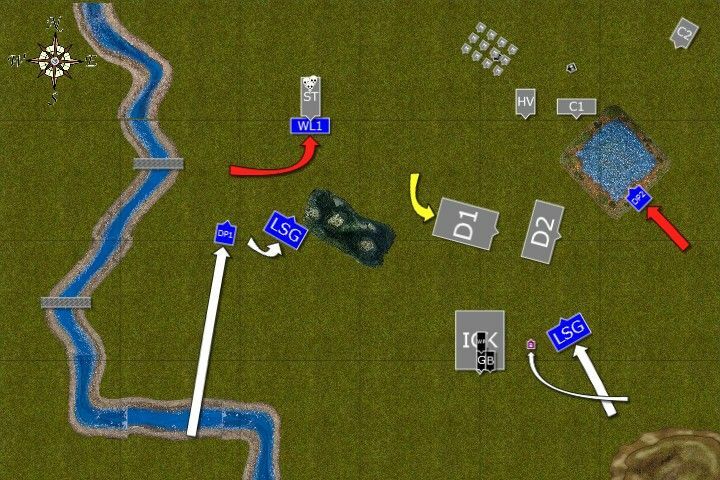 They were dangerously in the open now but were determined to get to the cursed enemy artillery soon. 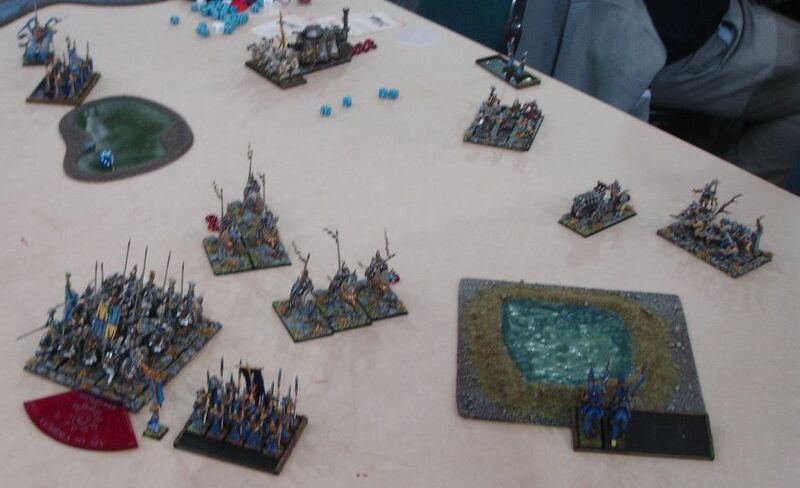 On the West depleted but still intact elven regiments set up a trap to catch demigryphs avoiding them. Elven archmage tried to support them but yet another disaster struck. He drew too deep from magical current and the feedback of the energy caused a massive detonation which seriously harmed nearby archers and Swordmasters. The archmage was drawn into realms of chaos and few survivors from both regiments lost their heart to fight believing all is lost. With so many elven regiments gone Empire troops simply redressed their formation. Artillery once again shot at elven cavalry and 3 more knights fell dead while Grandmaster and his regiment routed archers blocking their way. It was clear at this stage that Empire won the battle but the question was by how large margin. 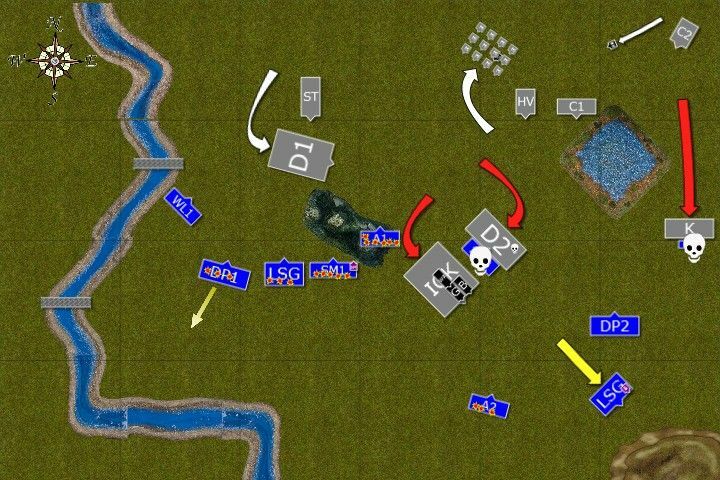 White Lions on the West charged demigryphs but when they fled Chracians swiftly redirected their attack at the steamtank and proceeded to chop it down but the tank was indeed tough and was still barely functional. Dragon Princes desperately tried to reach crossbowmen in their charge but cursed maze slowed them down. 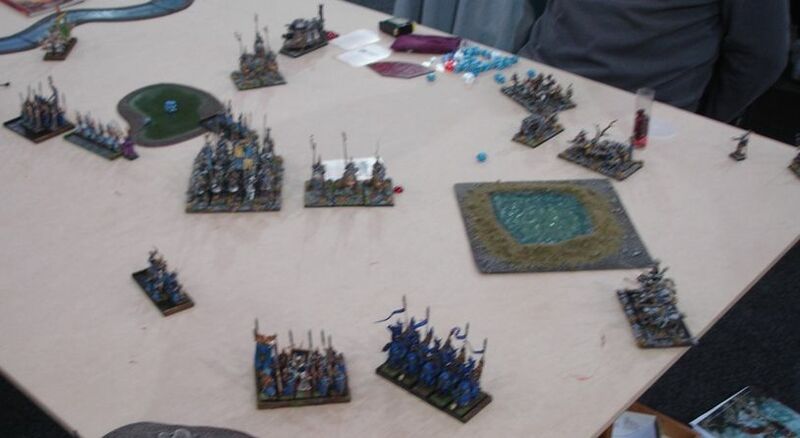 Sea Guard expose themselves at the charge of demigryphs while BSB moves away from the unit. Dragon Princes are again a target of the enemy shooters and this time there are no survivors. Their companions share their tragic fate as magical thunderbolt stroke them down and panicked nearby sea guard. Another sea guard regiment managed to hold against demigryphs but it was clear that only for a while. Even White Lions could not finish the steamtank as its armor deflected all but one hit. White Lions finally manage to destroy steamtank but it is not going to change anything in this battle. 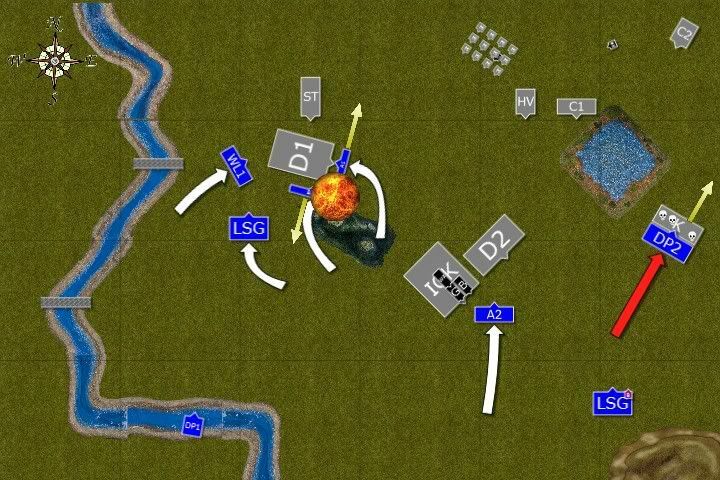 BSB tries to move away from the enemy, is he going to make it to the safety though? Victorious Lions are punished for their attack and cursed hellblaster volleygun kills them all. Even BSB cannot escape his fate as celestial wizard sends another thunderbolt to kill lonely elf. Thus ending the disastrous battle for elven army. 1. Deployment - not the best one for sure. Placing archers first was not the good idea this time as I could not focus their fire at the volleygun from safe distance. 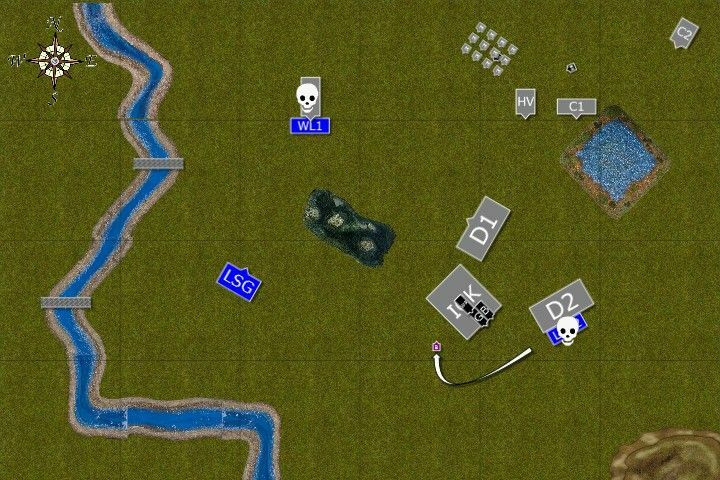 I think I could create such situation where on the Eastern flank I could keep regiments more than 24" away from the volleygun but keep shooting at it (I inflicted 2 wounds on it after all so 1-2 rounds of shooting could finish it hopefully). Even if it moved forward it was one less shooting phase for it so good for me. I could keep both regiments (lions and princes) where they were more or less to guard archers and be able to counter if necessary. 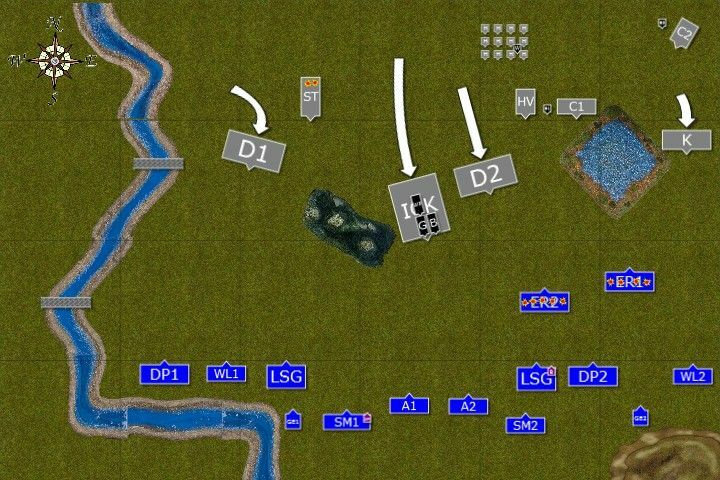 I didn't use the river either as I could have sent two cavalry regiments there in wide outflanking maneuver which would threaten demigryphs more. 2. Vanguard - that was plain stupid. I cannot count on being lucky and win the roll off. 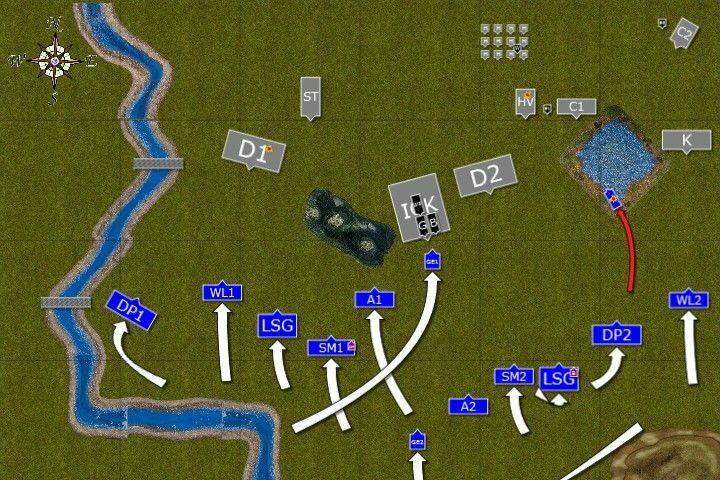 I knew that if I lose there are not enough units out there to provide target saturation. I simply gave them away fro free. 3. 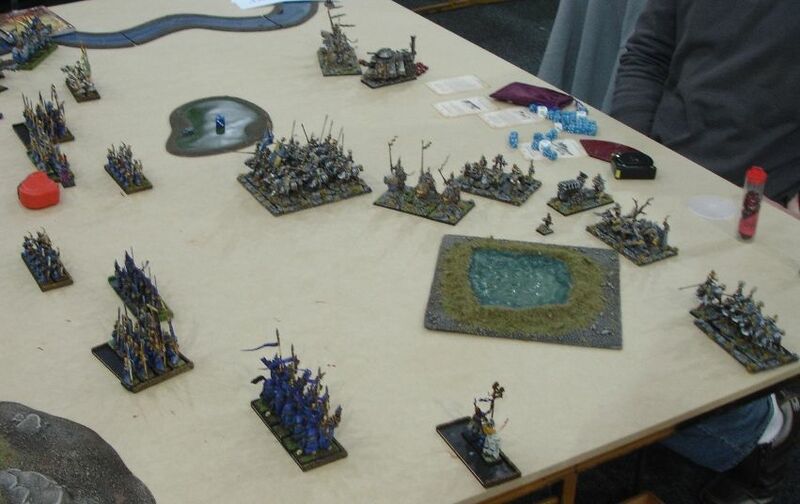 Swordmasters vs. Demigryphs - it can be considered as a mistake but I think I had a good chance at killing one of the models before they attacked (similar number of attacks from DP killed 3 knights). Unfortunately for me Rowan had way above average roll for armor saves which was further augmented by Harmonic Convergence. Then he proceeded to roll above average number of hits and killed entire unit on the charge. Having said that I think I might not risk such situation again or send Lions instead. I don't mind losing games but I wish I managed to put up a proper fight. Ah, well, live and learn. :) I hope I was not too gloomy during the game but it was indeed hard to overcome the disaster in turn 3. 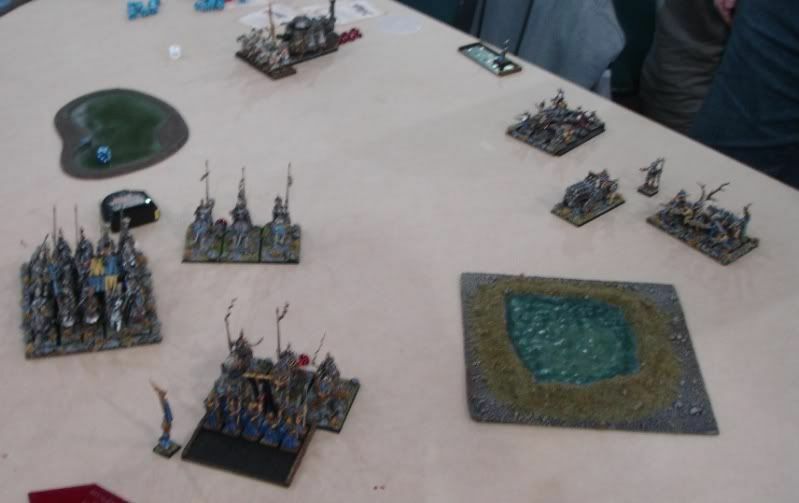 I must also say that there were no army and no general who could put up a fight against Rowan during Wintercon and he proceeded to massacre each and every opponent in all 8 games losing only ... 2 points during entire tournament! I have never heard about such fantastic result.